GM plans to cut 47,000 jobs globally by year end. Pictured is headquarters in Detroit. DETROIT -- GM has asked U.S. government for an additional $16.6 billion in federal aid to help it survive. Without the new funding, the automaker could run out of money sometime in March. Under the plan submitted to the U.S. Treasury Department Feb. 17, GM loans and lines of credit would total $30 billion. GM would also cut 47,000 jobs globally by year end and close five U.S. plants by 2012. It raised the possibility of killing the Saturn brand when production of its current models ends in 2012. GM received the last installment of a previously approved $13.4 billion loan Feb. 17, but is requesting another $4.6 billion to meet its Dec. 2 request of $18 billion. It then will ask for $4.5 billion to help it repay a revolving line of credit coming due in the fall of 2011. GM also is asking for a $7.5 billion revolving line of credit to help it if auto sales worsen later this year or next year. GM plans to start repaying the loans in 2012. 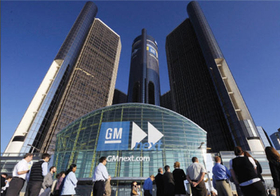 The proposals are contained in a restructuring plan made public by GM. Both GM and Chrysler were required to deliver plans to the Treasury Department on Feb. 17. Chrysler is asking for an additional $2 billion in loans. GM is in talks with the Swedish government and several other parties about Saab's future. Without funding help from the Swedish government, Saab would have to file for reorganization, the sources say. Hummer, which GM has had for sale since June, has attracted several interested parties. GM expects to make a decision on what to do with Hummer by the end of the first quarter, the sources say.